Cultivars of the common foxglove, Digitalis purpurea. 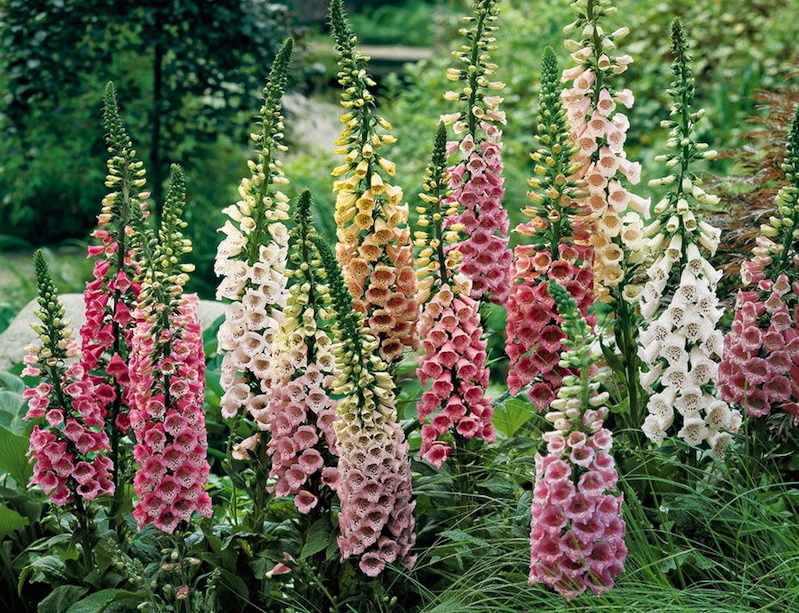 The etymology of the Latin name is straightforward, but the common name foxglove presents a puzzle. Digitalis … is a genus of about 20 species of herbaceous perennials, shrubs, and biennials commonly called foxgloves. This genus was traditionally placed in the figwort family Scrophulariaceae, but recent phylogenetic research has placed it in the much enlarged family Plantaginaceae. This genus is native to western and southwestern Europe, western and central Asia, Australasia and northwestern Africa. The scientific name means “finger-like” and refers to the ease with which a flower of Digitalis purpurea can be fitted over a human fingertip. [And purpurea is Latin for ‘purple’.] The flowers are produced on a tall spike, are tubular, and vary in color with species, from purple to pink, white, and yellow. The best-known species is the common foxglove, Digitalis purpurea. This biennial plant is often grown as an ornamental plant due to its vivid flowers which range in color from various purple tints through various shades of light gray, and to purely white. The flowers can also possess various marks and spottings. … The term digitalis is also used for drug preparations that contain cardiac glycosides, particularly one called digoxin, extracted from various plants of this genus. The reason for the second part of the name is obvious, as the flower resembles a finger-stall in shape; compare the Latin name. Why the plant was associated with the fox is not so clear; but compare Norwegian revbjelde = ‘fox bell’. Cooler heads, less given to imaginative speculation, treat the etymology as an unsolved mystery, as the OED does, cagily. This entry was posted on April 28, 2013 at 6:54 am and is filed under Etymology, Language and plants. You can follow any responses to this entry through the RSS 2.0 feed. You can leave a response, or trackback from your own site.